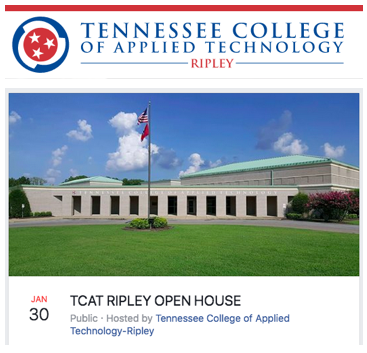 Tomorrow, January 30, 2019, Ripley TCAT (Tennessee College of Applied Technology) will host an Open House to the public to provide tours of the facility, assist in completing applications and corresponding FAFSAs, and answer any program related questions. The tours will be held from 9:00 a.m. until 5:00 p.m.
Any middle or high school students from Ripley Middle School, Halls Jr. High School, Ripley High School or Halls High School that attend and participate in the tour after regular school hours will receive a ticket as proof of attendance. Submit that ticket to your school to receive an out of dress code day. We encourage students and adults to check out the TCAT facilities and see the great things they have to offer.